In fact, there is solid research to show that CBT is just as effective as medication in many instances of depression and anxiety. That is why it has become the therapy most recommended by doctors. CBT is based on the well accepted theory that our behaviours arise out of our feelings, and our feelings are generated by our thoughts. It’s pretty obvious when you look at it. But in many of our destructive habits and moods, we don’t take the time to analyze exactly what is happening in this process, and we fail to objectively examine the underlying thoughts that are creating much of our pain. CBT helps us to break down overwhelmingly large and unsolvable life problems into its parts, and then gives us tools to swap out and shift the bits that are not working properly. 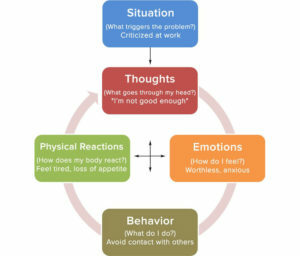 By understanding how all of these connect in your life, we can question and reframe some of the source ideas (cognitions) which support the rest of the cycle, and we can shift behaviours that have been accidently feeding-back into a vicious circle that has been supporting the original, problematic ideas. Although CBT has the gold stamp of academia and the medical world on it, it should be noted that among many of the most respected and talented therapists, CBT is not, actually, the method of therapy that is general felt to be most effective. Among many modern clinicians, it is agreed that CBT is an essential concept but a limited therapy. Be careful with counsellors who rely too heavily on the CBT protocol. Often, this is done by novice therapists or agencies that need to codify their clinicians – but it leaves little room for the flexibility and depth work that needs to be done. At Wise Path Counselling, CBT is often incorporated into other forms of therapy in a way that feels natural and less formalized than the structured way that it is often proposed – and which clients often despise. We are not going to send you home with lots of paper homework (that you’re not going to do anyway) – unless you really want that! Many clients have come into the office after doing a year of CBT elsewhere and are amazed at the powerful sessions we can have when other modalities are used in conjunction with CBT. This allows for every client to have their own learning process and for other elements of therapy to take precedence when they need to. CBT takes practice, courage, and a willingness to truly look at what drives you. But if you are willing to do the work, it can be a lifetime tool for greater richness in your life! If you are looking for experienced cognitive therapy counselling in Hamilton that makes room for your own personal process, get in touch today for a free consultation.